Anyone who has ever had a cat can testify that they love boxes. Images abound of cats contentedly squeezing themselves into all sorts of containers and making themselves at home. 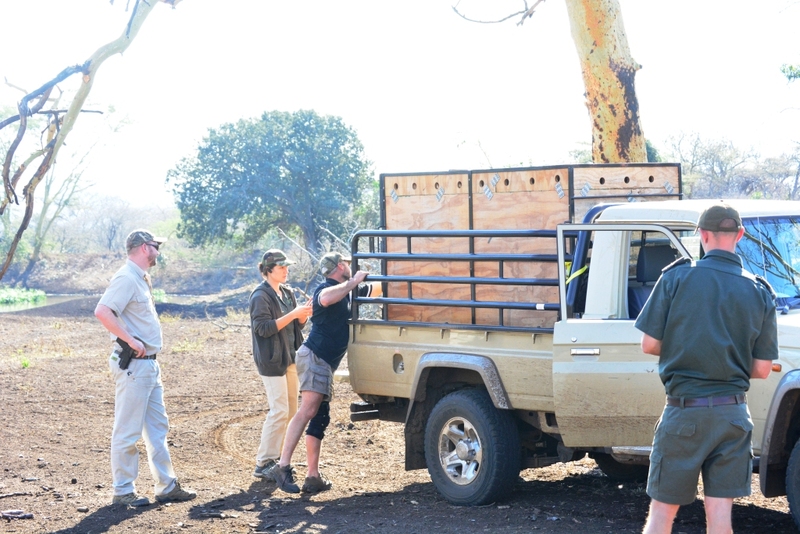 Perhaps then it should have been no surprise when during a relocation of a female leopard to the Zululand Rhino Reserve, she chose to stay in the comfort of her transport box much to the chagrin of the team attempting to facilitate her release. On the morning of 29th July, the reserve’s general manager, Karen Holmes, was sitting through a first aid course along with Rhino River Lodge manager Dale Airton. While anticipating a rather boring afternoon spent in an office, Karen’s phone rang and the course of their day suddenly took a more interesting turn. 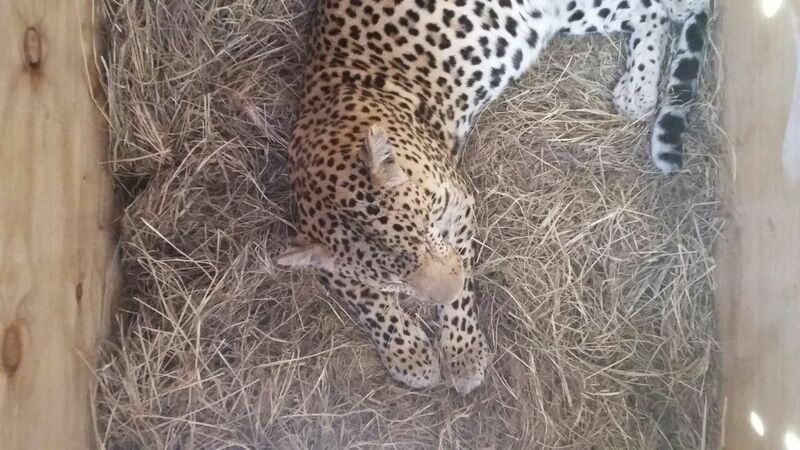 A female leopard had entered a breeding camp on a nearby farm and it needed to be relocated. And quickly. Leopards are one of the most widespread and ecologically flexible predators in South Africa. This is good news for the species’ overall survival but bad news for many individuals as it often brings them directly into conflict with farmers. In the not too distant past, a farmer’s solution to a problem like this would have been to simply shoot the animal. Through the significant efforts of the Panthera Leopard Project and conservation authorities in the area, many are now choosing to contact local authorities for assistance before taking matters into their own hands. But a farmer’s patience understandably runs thin and action must be taken swiftly for a positive outcome to arise. The leopard arrived in a crate on the back of a truck at approximately 1pm. She was awake but sedated. Leopards are a species that don’t shy away from a fight when feeling threatened, and they have a reputation for sometimes attacking when being released. With this in mind the team proceeded with extreme caution. So the issue at hand was to work out how to get the leopard out of the box without endangering anyone. A rather clever rope pulley system was constructed, whereby a rope was attached to the door of the leopard’s box and strung up and over a tree. It was then tied to another truck, which was reversed causing the door to the box to open. With the team’s concerted preparation efforts, followed by lots of mutual praise passed around at coming up with the idea, the plan was put into action. As the truck reversed, the door slid open and… nothing. Nothing happened. No leopard emerged in a blur of growls and fur. And there was no triumphant celebration of the team’s conservation achievement for the day. All that happened was that the leopard continued to sit comfortably in the box. So how do you coerce a big cat out of a comfy box? And how do you do it without stressing her? They removed the door completely with the rope pulley system but to no avail. They drove the truck backwards and forwards in the hope that some motion would give her the impetus to move. But nothing seemed to have any effect. Hoping a little noise would help, they banged the door a bit against the top of the box. But nothing could budge this cozy feline. You can only imagine the increasing frustration and general frazzled state of everyone involved. Now compare that feeling to this face. The leopard remained completely cool, calm and collected. As she was clearly feeling quite relaxed and secure, a consensus was taken that any further attempts were futile and she should be left to emerge in her own time and of her own accord. 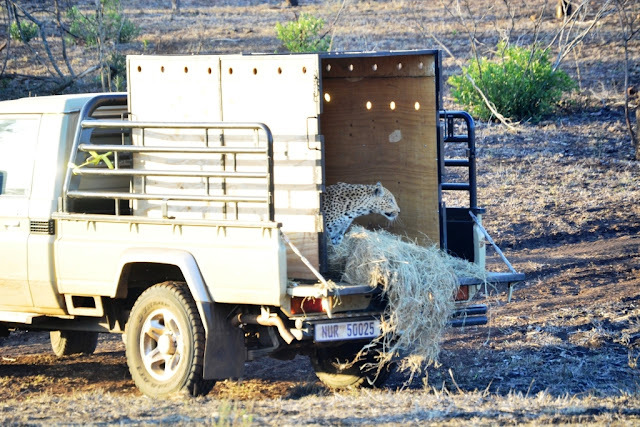 By approximately 5.30pm the leopard relocation was successful as she finally left the comfort of her transport crate. The female was visibly pregnant and the hope is that she will integrate herself into the Zululand Rhino Reserve leopard population. The whole experience, although ultimately successfully, was a great example of how, when it comes to conservation efforts, even the best made plans can fall short. Or maybe the moral of this story is simply that sometimes a cat just really likes being in a box. Maybe there is the need to have a reinfored roof with a metal ring so that the crate can be lifted off the vehicle and left on the ground. This way the animal no matter what species it may be can leave the crate whenever it feels comfortable and at ease to do so.